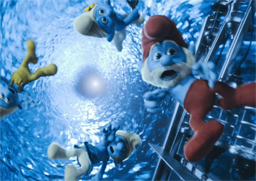 Things are about to get blue at the box office as the Smurfs return to the big screen in The Smurfs 2. This time Gargamel has created the Naughties to mess with the Smurfs and steal their smurfy essence. 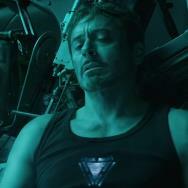 The return of Papa Smurf, Smurfette, Vanity, Clumsy and their blue brothers made us think about our favorite blue movie characters -- ones that aren't three apples high, that is. Mystique: The natural state of this shape-shifting mutant, who can change herself to look like any other person, is a blue beauty with yellow eyes and red hair. 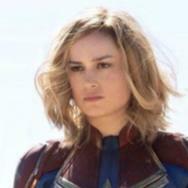 Rebecca Romijn played the supervillain and right-hand mutant of Magneto in the first three X-Men movies, while Jennifer Lawrence (pictured) played a younger version of Mystique in X-Men: First Class. 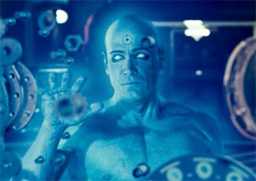 Dr. Manhattan: In The Watchmen, Billy Crudup played the godlike, glowing blue superhero known as Dr. Manhattan, who can do some chores while he makes love to his girlfriend in the other room, teleport himself to Mars, probe your memories, move objects with his mind… and pretty much anything else he wants. 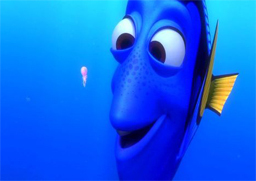 Dory the Regal Blue Tang: Ellen DeGeneres voices Dory, the aggressively optimistic regal blue tang with serious short-term memory issues, in Finding Nemo. She means well and tries to help get the resilient titular clownfish home. 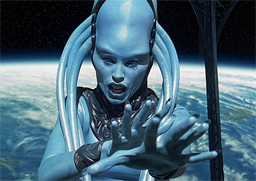 Neytiri: Of all the blue-skinned Na'vi that populate the planet Pandora in Avatar, our favorite is Neytiri, played by Zoe Saldana. 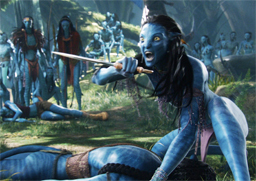 The daughter of the leader of the Na'vi clan, she is central to the story and can't help but be attracted to Jake's brave avatar (Sam Worthington), even though he is "like a baby, clumsy." Diva Plavalaguna: All the magical elemental stones that can help save the universe in The Fifth Element are hidden within the body of the towering blue opera singer Diva Plavalaguna, who works a gig on a space cruise ship bound for Fhloston Paradise. Getting the stones out of her is gonna hurt. 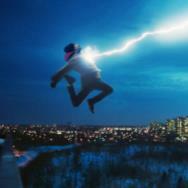 All of the movies listed above are available on DVD and Blu-ray as well as various VOD services. Which blue movie character do you think is smurfiest?